Usborne First Hundred Words in Italian serves as a novel vocabulary-builder, teaching 100 new Italian words. Each object in the book is clearly labelled with its Italian name (including definative article), with the English word underneath. An alphabetical Italian / English list of all the words used is provided at the end of the book, together with an easy-to-use pronunciation guide. Children will love looking through each double page spread in search of the well-renowned 'yellow duck' ™. 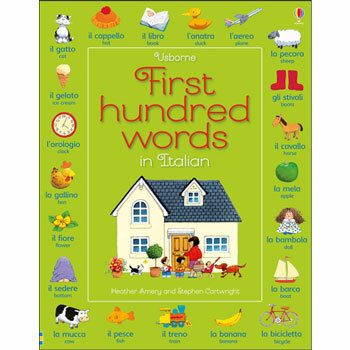 Usborne First Hundred Words in Italian is suitable for children of all abilities, even complete beginners. The easy-to-use pronunciation guide will help parents having no previous knowledge of Italian to enjoy using this book with their child. I've been waiting for this book for a long time as there is very little at this basic level. Whilst it is great I would have liked to see some of the vocab in a wider variety of settings other than the home e.g. farm animals at a farm rather than as toys.